In 2008 The 300 Committee sought $400,000 in CP funding as a contribution to the cost of the Town’s purchasing an 11-acre parcel known as the Grinnell property off Metoxit Road in Waquoit, also known by the pond it includes, a salt-water embayment of Waquoit Bay called Calebs Pond. When purchased, the property became part of the Waquoit Bay Research Reserve. The total cost of the purchase was $1.81 million, funded also with a $985,000 grant from the National Oceanic & Atmospheric Administration’s Office of Ocean & Coastal Resource Management, and $425,000 from the state Department of Conservation and Recreation. Waquoit Bay is Falmouth’s largest estuary, and the Grinnell Property/Calebs Pond was at the time the largest remaining undeveloped parcel on the estuary not already protected by the Waquoit Bay National Estuarine Research Reserve (WBNERR). The Town of Falmouth had nominated Waquoit Bay for designation as an Area of Critical Environmental Concern in the late 1970s, and residents formed the Citizens for the Protection of Waquoit Bay in 1981. At the urging of members, the State purchased Washburn Island and South Cape Beach and designated in 1998 WBNERR’s 2,780 acres of protected open space as one of twenty-seven national reserves across the country. Its purpose was two-fold: protection of the estuary and research and education to help coastal planners understand and mitigate negative human impact on estuarine ecology. As a result of these efforts, Waquoit Bay has the least developed shoreline of any of the Town’s waterways. The eleven undeveloped acres of the Grinnell Property/Calebs Pond lie in the northeast corner of Waquoit Bay, immediately south of Waquoit and east of WBNERR headquarters. The property contains upland coastal pine-oak forest habitat with fringing salt marsh on Calebs Pond and fronts on the Waquoit Bay estuary, Bournes Pond (a freshwater glacial kettle pond), and a small connecting stream, all of which are waters currently designated as lying within the Waquoit Bay Reserve. It is separated from the WBNERR headquarters by only one parcel, the Simpson property, which has recently been protected by a conservation restriction negotiated and held by The 300 Committee. 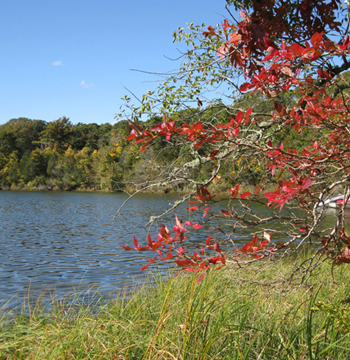 The purchase of the Grinnell Property/Calebs Pond effectively creates an area of over forty acres of linked protected lands stretching across the head of Waquoit Bay. The area contains fresh and saltwater habitats of a variety of ecologically and commercially important fish, shellfish, birds and wildlife. It protects aquatic, estuarine and migratory species dependent on the pond shore, the stream, the salt marsh and the estuarine embayment. It also works to reverse recent dramatic decline in water quality, eel grass beds, and abundance of fish, shellfish and waterfowl due to nitrogen loading associated with residential development. The area offers passive coastal recreation, research access, and education through WBNERR’s large outreach program.